Save the agent back and re-run it. After the correct encoding, configuration is applied in agent, the web scraper will produce the output correctly in clean format for Japanese, Chinese or any other language. 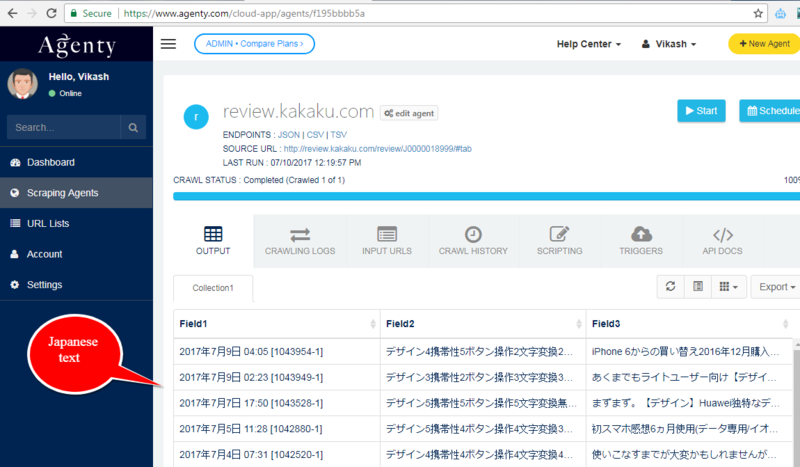 For example, if you see the screenshot below, I ran the kakaku agent, the text is formatted correctly in output table with the same Japanese language as on website. So, whether it's Chinese text, Japanese text or any other language, as far as the correct encoding is selected in Agenty online scraping app, the scraper will extract the text exactly same as it appears on the website or displayed on any other browser like Chrome or Firefox. Once the scraping job is completed and output is ready in the table, you can download the output in CSV, TSV or JSON format. We recommend the TSV(Tab Delimited) format for Non-English language websites as that's the format used to extract and store the web data on cloud-server and converted into different format on download requests. Be sure, your Accept-Language header in header section is set to * (asterisk) to allow HTTP reader to accept any language websites like Chinese, German, French etc. Now, the question is how to find the correct encoding used by website and what if a website is using some other encoding in actual while mentioned something else in header charset. Yes, there might be some cases where the character encoding mentioned in charset is different then actual or may be nothing mentioned as well. For those cases, we use the W3 Validator, where you can enter the url of website or just paste the text (website source) to detect the actual encoding used on that language text. For example, if you see the screenshot below, I use the website url and submit to validation, in result the w3 validator detected the shift_js encoding automatically.